Woah or Whoa: What Is Your Choice? 3 What Do People Say About Woah or Whoa? Is it whoa or woah? How exactly do you spell that little exclamatory word that rhymes with “low”? According to dictionaries, “whoa” is the correct spelling, but words that are mainly spoken tend to have varied spellings when people write them down. However, the word “whoa” is not only misspelt on blogs and discussion board posts – you also see the misspelling in lyric sheets, film subtitles, YouTube videos, and many other sources of writing. In the Penguin English dictionary, “whoa” is described thus, “used as a command, e.g. to a horse, to stand still.” “woah” isn’t mentioned at all. A quick search of Google Books Ngram viewer, which records published incidences of words, shows that “whoa” has been going through phases of popularity since 1700. 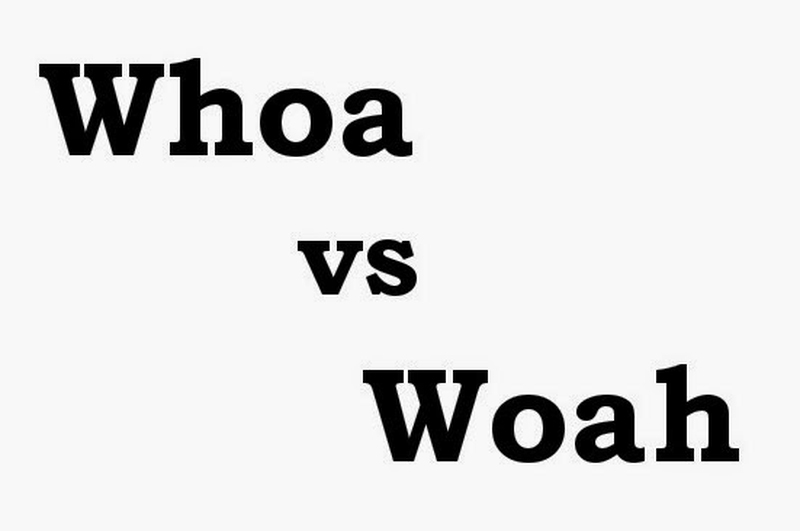 By contrast, “woah” was only mentioned for the first time in 1803, and has been used very little at least until the 90s with the advance of the internet age. This would be the end of the debate, but it turns out that there’s more to this little word than meets the eye. - Whoa, horsey! Whoa!... Whoa! Whoa! Whoa! Aw, come on, horsey! Please, horsey? Please, whoa. Purty please? Doggone it now, horsey! Won't you please whoa? - Because that cop's looking for you. I gotta get you a new identity, some new clothes, a different car would do for now. Put these on. - Whoa, whoa. What cop? - Hey, do you want to see something cool? Come on. - Whoa! Did you... Did you paint this? Keanu Reeves and Alex Winter seem to pronounce the word more as “woe” than “whoa”. Indeed, the “woah” spelling seems more appropriate for meaning “wow” than “whoa” ever did. “woah” may also be increasing in usage thanks to the internet and the lack of copy-editing in web writing, so it may, one day, become a recognized variant. However, the only official version of the word appearing in dictionaries remains “whoa”. You would only use “woah” to indicate a particular accent. The “woah” spelling is also being frequently used in British newspapers, magazines, websites, and advertisements. Therefore British English dictionaries may in fact be the first to include “woah”. For writing about horses and horseman, go for “whoa”. For a figurative “Stop” or “Slow down”, use “whoa” again. For characters or prose with a formal voice, “whoa” is again correct. However, if you want to depict an American surfer or stoner character in a “wow” moment, “woah” may be the best choice. What Do People Say About Woah or Whoa? Wait for your response to the use of whoa or woah!